Obata, Chiura (1885 - 1975), "San Francisco From The Berkeley Hills"
15 -1/2 x 20 -1/2 "
Notes: Signed in black ink with artist red seal; lower right. A scenic view of San Francisco, includes Treasure Island (Yerba Buena Island) and both the Golden Gate and Bay Bridge. The Shipping docks are also captured in the lower portion of painting, with towering eucalyptus trees dominating the right portion of the work. As noted in the book, Obata's Yosemite: 'The color of water he used might be called "Obata blue," so frequently does it appear in his paintings. Obata looked to the Tosa School, whose artists he considered the finest colorists of Japan, for selecting and dissolving pigments. Following formulas some of which were more than a thousand years old, Obata ground his own paints from a variety of materials, including precious and semiprecious stones, flower petals, and oyster shells. For his blues, Obata ground lapis lazuli; for greens, he ground malachite, turquoise, or peacock stone. He is reputed to have used ruby dust for special reds - at a cost of seven hundred dollars for a tiny vial. 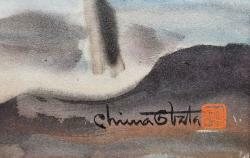 Chiura Obata was born in 1885 in Okayama prefecture, Japan. At the age of 14 he went to Tokyo where he studied with Tanryo Murata, Kogyo Terasaki and Goho Hasimoto. In 1903 he moved to San Francisco and while working (1915 - 1927) as an illustrator for the cities Japanese newspapers, The New World and the Japanese American, Obata made on-site sketches of the San Francisco earthquake. He spent much of the 1920's painting landscapes throughout California and helped establish the East West Art Society in San Francisco in 1921. Obata spent the summer of 1927 on a sketching tour of Yosemite and the Sierra high country producing over 100 new paintings. In 1928 Obata returned to Japan, following his father's death. While there, he supervised the production of 35 colored woodblock prints of California landscapes for his World Landscape Series. They were exhibited at the "Eighty-Seventh Annual Exhibition" at Ueno Park, Tokyo; Lake Basin in the High Sierra won first prize. In 1932 Obata was appointed as an instructor in the Art Department at the University of California, Berkeley. Between 1930 - 1941, One-man exhibitions were held in numerous locations. In April 1942, Obata was interned at the Tanforan detention center where, during his stay, organized an art school with over 650 camp residents as students. In September 1942, he was moved to the Topez Relocation Center, Topez, Utah. Released from Topaz in 1943, he moved with his family to St Louis, finding employment with a commercial art company. In 1945, when the military exclusion ban was lifted, Obata was reinstated as an instructor at U.C. Berkeley. He was promoted to Associate Professor of Art in 1948. In 1954 he became a naturalized citizen and retired as Professor Emeritus from U.C. Berkeley. From 1955 to 1970 he traveled throughout California giving lectures and demonstrations on Japanese brush painting. In 1965 he received the Order of the Sacred Treasure, 5th Class, Emperor's Award, for promoting good will and cultural understanding between the United States and Japan. He died in 1975, at age 90. 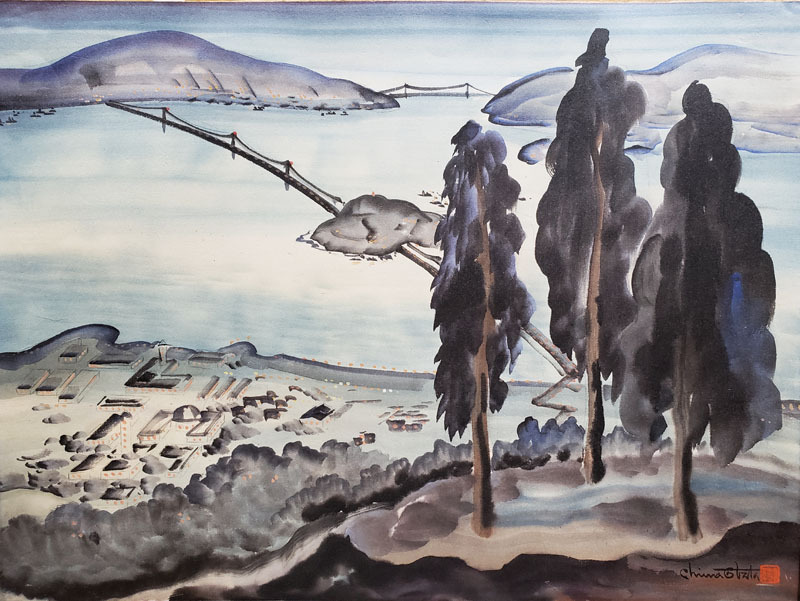 Posthumous exhibitions of Chiura Obata works have been organized at the Oakland Museum, The Smithsonian Institution and most recently at the M.H. de Young Museum in San Francisco, in 2000.